This beautiful ice cream is simply delicious: it’s lemony and grassy from the herbs. Our CSA grew lemon verbena for the first time this year and now, in September, it’s on to a lush second growth and is plentiful. I bring home a bunch nearly every week and surprisingly find a lot of uses for it, some of which I will be posting soon as part of my “preserving herbs” series. I put together this recipe from other infused ice creams that I’ve made, feeling my way into the proportion of cream to milk (I used nonfat milk and more of it compared to the amount of cream than I’ve seen in other recipes). 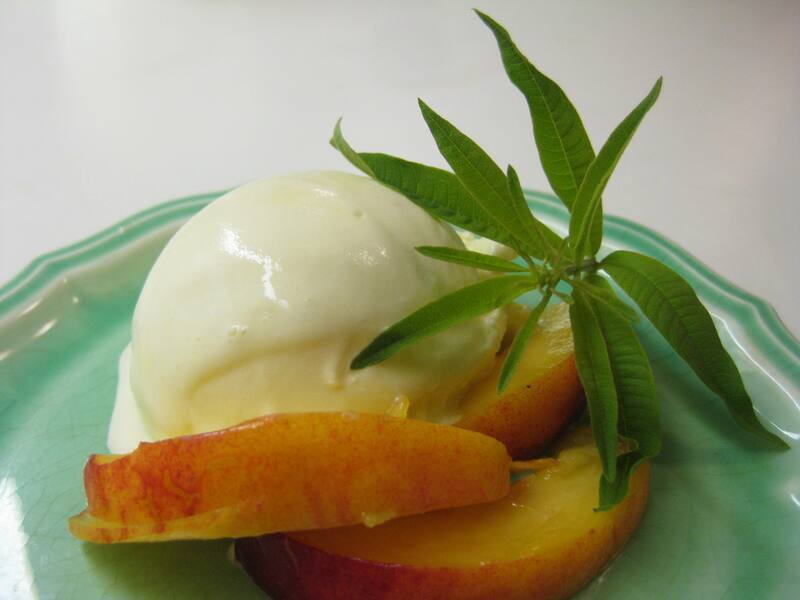 I did not feel the need to snip some leaves into the finished ice cream but if you had less verbena to start with, it would increase the strength of the lemon and grass overtones. Warm the milk, sugar and pinch of salt over medium heat, stirring until the sugar is dissolved. Add the lemon verbena leaves and heat until the milk is nearly boiling. Turn off the heat and let the mixture steep for an hour. Beat the egg yolks in a medium bowl. Remove the lemon verbena leaves from the milk and discard the leaves. Reheat the milk. Add a little milk to the egg yolks, whisking or stirring to warm the yolks without cooking them. When the yolks and milk are combined, return the mixture to the saucepan and cook gently, over medium low heat, stirring, until custard forms and is thick enough to coat the back of a spoon. Meanwhile, place the cream in the bowl and put a strainer over it. When the custard is done, pour it into the cream. Let the mixture cool (place it into a larger bowl with ice water), add a sprig of lemon verbena and refrigerate until well chilled. Process in an ice cream maker according to the manufacturer’s instructions. Fold in snipped leaves of lemon verbena if you want a stronger mixture. This sounds incredible! I was introduced to lemon verbena this summer by a lady who insisted I try it after I bemoaned my love/hate with lemon balm. She was right, it is a lovely herb and I’ve used it everywhere. Never thought to do ice cream though! I might give it a try before the frost gets the last of it.